This image archive, supported by the NASA National Space Science Data Center (NSSDC), features photos taken during NASA space missions (Apollo, Gemini, Mariner, Voyager, and others) and the Soviet Venera probes to Venus. The photos are organized by subject: each of the planets, Earth's Moon, and other objects in the solar system such as comets and asteroids. Each subject category includes a fact sheet with information such as orbital parameters, bulk parameters, and other details about the objects photographed. Each image is accompanied by a brief description and information about location and time when the photo was taken, imaging properties, and ordering information. 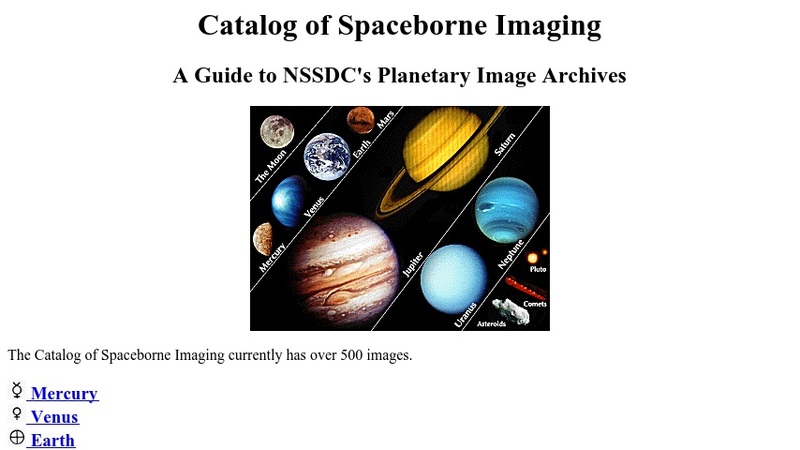 The photos are also indexed by mission, with links to pages of the NSSDC site describing the mission. The photos may be downloaded in high- and low-resolution versions, or ordered as hard copies (prints, transparencies, or 35 mm slides).